Back row: Bradley Rickard, left, Caleb Ibbotson, Reid Samson, Shania Bate, Luke Burgess, Daryl Shave, Viv Barakat and Leighton Duerre. Middle row: Glenn Williams, left, Joeb Ibbotson, Luke Barakat, Thomas Heays, Jamie Mudford and Nick Barakat. Front row: Matt Barakat, left, Braydon Burr, Bree Heays, Dylan Lovell and Noah Burgess. 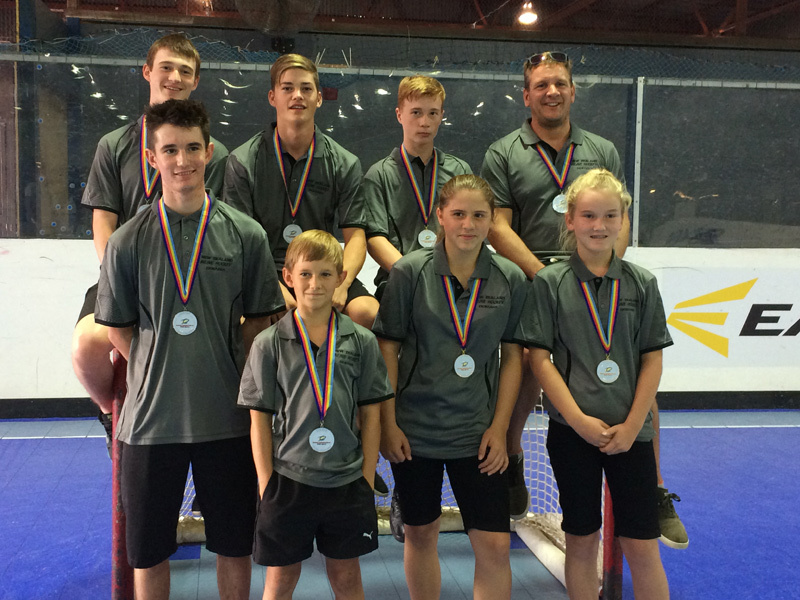 Waihi was well-represented across all grades of the New Zealand Inter Regional Inline Hockey Championships for 2016. Rachelle Heays said the Miners inline Hockey Club players, playing for Central Region, covered from Under 10 to Open grades. 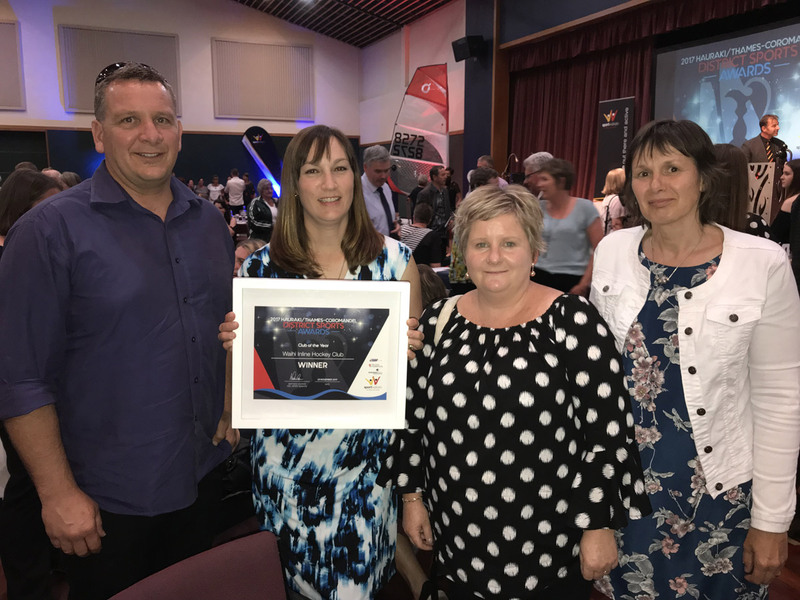 "We are very proud of our reps who helped their teams bring home several gold medals which was the culmination of a great year of hockey for the club," she said. Braydon and Dylan Lovell played in the Central U10 team, Matt Barakat and Bree Heays played in the U12 team, Luke Barakat and Noah Burgess played in the U14 team and Jamie Mudford played in the Junior Women side. They all did their part in bringing home gold medals. 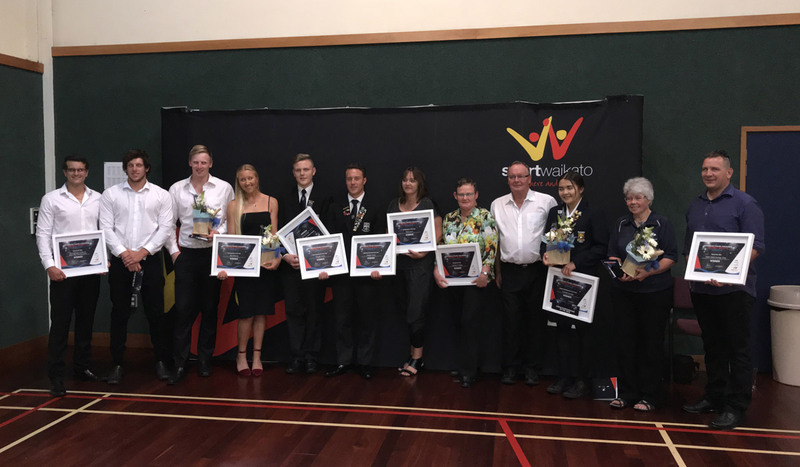 Also helping Central to win medals were Joeb Ibbotson, Bradley Rickard and Nick Barakat in the U17 team, Shania Bate in the Senior Women and Veterans Viv Barakat, Daryl Shave, Leighton Duerre, Andy Wilton and Luke Burgess. The Central U21 team with Nick Barakat, Thomas Heays and Reid Samson, the Senior Men with Caleb Ibbotson and the Masters with Glenn Williams each took home a. bronze medal. In addition to this Caleb Ibbotson played in goal for the Green Senior Men's Open League team which won the Open League competition. Open League teams were selected from the top men's players from all over New Zealand. Miners club member Leighton Duerre, went to Italy in June for the FIRS World Cup with New Zealand Veterans team. Joeb lbbotson, Jamie Mudford, Caleb lbbotson, Viv Barakat, Daryl Shave and Luke Burgess all played in Hawaii at the AAU Inline Hockey Championships during July with Matt Barakat and Noah Burgess going along as well as part of the New Zealand Junior Development side. Eight Waihi Miners Inline Hockey players received an early 2014 Christmas present by being selected for New Zealand Inline Hockey teams to play in the 2015 Oceania Tournament to be hosted in Moe, Victoria, Australia during April. Players were informed in December after attending trials in New Plymouth in October 2014. New Zealand Under 12’s Toby Grindlay (Goalie), New Zealand Under 14 Junior Women’s, Katie Lovell and Jamie Mudford, New Zealand Under 14’s, Joeb Ibbotson, New Zealand Under 17’s, Zane Cleary, Johnnie Andrews-Nye and Caleb Ibbotson (Goalie) and the New Zealand Vet’s, Luke Burgess (Goalie). Toby Grindlay described hearing the news as "amazing”. Having being selected in 2014 for the Central Region Oceania team, this was Toby’s first selection for a New Zealand team. Weekend team trainings were held in various venues around the North Island to prepare for the Oceania Tournament with Katie Lovell and Jamie Mudford travelling to Levin twice to train with the New Zealand Under 14 Junior Women’s team. While a great bonding experience as the team previously played against each other during 2014, there was also a lot of hard work involved with full day training sessions designed to challenge but also bring the team together as a unit. On top of attending the New Zealand team trainings and the Waihi Miners team trainings, each of the players also worked on their own individual training sessions leading up to the Tournament. Joeb Ibbotson worked on his cardio and general fitness by running and biking. Johnnie Andrew-Nye has been working hard during the past 12 months leading up to the Oceania tournament with daily hockey specific workouts ranging from shooting techniques, hill sprints and weight training to increase his overall fitness and skills for Inline Hockey. The Waihi Miners Inline Hockey Club travelled to Auckland and competed in the 2015 Bauer Cup over the Easter long weekend. Many of the New Zealand Representatives left for Australia the day after the Bauer Tournament including most of those from the Waihi Miners Inline Hockey Club. For some, as this was the first time being selected into a New Zealand team, their families travelled over to Australia with them to share in the experience to watch their family members play international Inline Hockey. Arriving in Moe, the teams were greeted by representatives from the New Zealand Inline Hockey Association (NZIHA) who had travelled prior to set up the accommodation, travel, training schedules and to prepare for the 4 days of non stop games. A tradition in Inline Hockey is to kit the “Rookies” out in outrageous outfits and to complete some “dares”. Rookie treatment included parading around the venue while dressed as a hula girl, wearing clown outfits and doing a lap on the rink. A number of Waihi Miners players all participated in their Rookie dares with good humour while creating some lasting memories. The Athlete’s Parade was held on Thursday 9th April and as each team was walked onto the rink, the players names were announced to the rink. For some this was a very defining and proud moment hearing their name being announced during the ceremony. During the four days of games, Australia had an official web site that was updated regularly with the scores. Luckily for the Waihi Miners Inline Hockey Club, Simon Lovell was over in Moe providing real-time game commentary, photos and videos via the Waihi Miners Facebook page. Many friends and family here in New Zealand were thankful for the continuous and exciting updates as to how the teams were playing. For some their hard work, dedication and training paid off in winning their games against Australia. There was some amazing hockey played with some very close results. First place: New Zealand Junior Women’s and New Zealand Under 14 team’s. Second Place: New Zealand Under 12’s, New Zealand Under 17’s and New Zealand Vet’s. Australia claimed the Oceania Cup back from New Zealand from the previous year. A highlight of the Tournament for NZ Under 17 Goalie Caleb Ibbotson was being the goalie in the game that New Zealand won against Australia. Despite having represented New Zealand three times before, being picked for this years New Zealand team was “wickedly exciting as well as feeling totally proud of his team and his hard work”. After the closing ceremony a number of players swapped their spare Players Jerseys as a souvenir to bring home. Being able to proudly display not only their New Zealand Player Jersey but also their rivals. Photo Credit : Sally Grindlay. Front row, Left to right: Johnnie Andrews-Nye, Toby Grindlay (Goalie), Katie Lovell and Jamie Mudford. 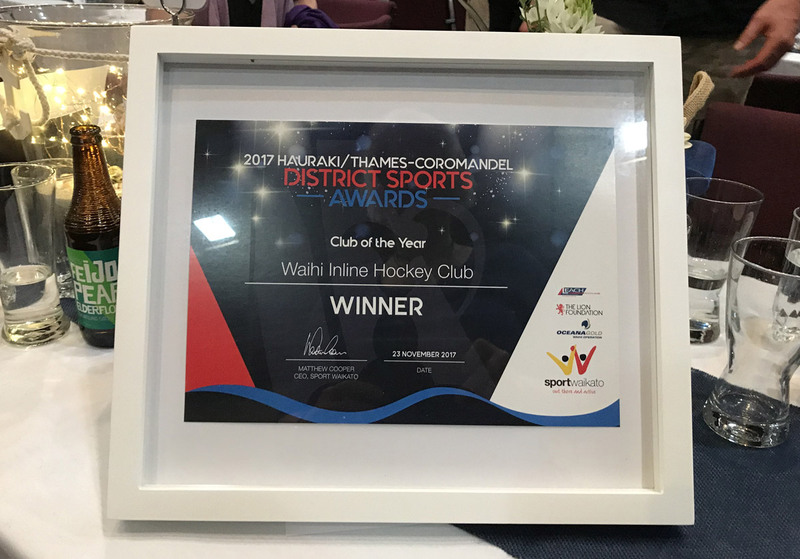 Waihi is home to a growing number of Central Region and New Zealand Inline Hockey representative players and each year this number continues to expand. Already this year, Waihi Miners Under 12 player Matt Barakat has been asked to join the Inline Hockey team travelling to California, America to compete in the 2015 June NARCH tournament. Matt is travelling with the New Plymouth Ravens Club and is spending 12 days playing International Inline Hockey. The club congratulates Matt on his invitation and wishes him all the best. The Waihi Miners Inline Hockey Club was founded in 1995. Throughout the season, the club attends various tournaments, playing in the Central Region draw and a number of pre-organised friendly games against other clubs. Since 1995, the club has had a number of teams competing in the yearly NZ National Inline Hockey Championships. The top three teams from each of the three regions are eligible to enter the National Championships that are hosted by various clubs. Currently the regions consist of the Northern, Central and Lower Region's. In 2013, the entire Waihi Miners Inline Hockey club travelled to New Plymouth to complete at the Nationals and this year the Waihi Miners Under 16 team is currently in New Plymouth competing against the 3 other regions at the NZ National Inline Hockey Championships. The Under 16 team worked hard throughout the 2014 season to place 3rd overall within the Central Region to obtain a place at the NZ National Championships. We wish the team good luck and success. Every Labour weekend since 1997, the New Zealand Inline Hockey Regional Championship has been played in a venue at one of the three regions Inline Hockey rink's. Since 1998 the Waihi Miners club have had a number of players selected for various Central Region teams and 2014 is no different with the highest number of Waihi Miners players being selected. 23 Waihi Miners Inline Hockey players travelled to the Hamilton Rink to attended the 2014 Central Region Trials. Players trialled in the JW's, U12, U14 & U16 grades. Out of the 23 players, 13 were selected from the Waihi Miners Inline Hockey club for each grade including another 3 Waihi Miners for the Masters grade. Junior Women's: Shania Bate (Goalie), Katie Lovell, Jamie Mudford (Reserve) and Dechan Holley (Reserve). Under 12's: Toby Grindlay (Goalie), Lucus Barakat and Matt Barakat. Under 14's: Jaiden Pert (Goalie) and Joeb Ibbotson. Under 16's: Caleb Ibbotson (Goalie), Nathan Lovell and Zane Cleary. Under 19's: Rhys Allen and Johnnie Andrew-Nye. Veterans: Luke Burgess (Goalie), Viv Barakat and Andy Wilton. Photo: Waihi Miners Central Region Rep players. Dechan Holley, Zane Cleary, Rhys Allen, Viv Barakat. Jaiden Pert, Nathan Lovell, Johnnie Andrew-Nye, Katie Lovell, Shania Bate. Jamie Mudford, Lucus Barakat, Matt Barakat, Joeb Ibbotson. Caleb Ibbotson and Toby Grindlay. Absent: Luke Burgess and Andy Wilton. This year the New Zealand Inline Hockey Regional Championships are being held in Auckland. The club wishes these players and their teams good luck during the Labour Weekend tournament. 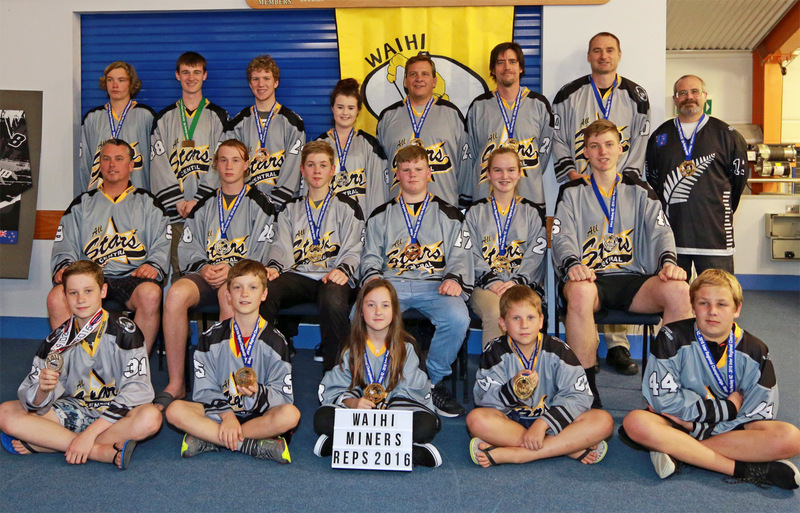 Over the years the Waihi Miners Inline Hockey Club have had players selected for various New Zealand Inline Hockey teams who have competed in International tournaments both here in New Zealand and in venues around the World representing New Zealand. This included the 2014 Oceania tournament, between New Zealand and Australia and Regional teams held in Hamilton this year.